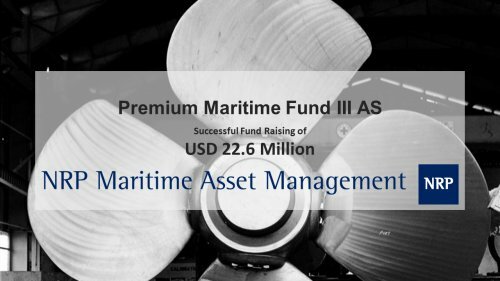 NRP are pleased to announce the successful fund raising of USD 22.6 million towards Premium Maritime Fund III AS. The fund will be the third in the series, following Premium Maritime Fund I in 2015 and Premium Maritime Fund II in 2017. The two previous funds have since 2015 invested in 24 vessels with a fleet value of USD 300 million (end of H1 208), and at the end of the third quarter 2018, total return on investment was at 15,9 and 20,3 percent respectively. With PMF III, the manager will over the next 12-18 months aim to create a diversified multi segment portfolio and the investment focus will be mainly on dry bulk, container feeder and product tankers. The fund will be managed by NRP Maritime Asset Management, a licensed AIFM by the Norwegian FSA.